I am personally unfamiliar with Tweeter, but I recall their bankruptcy around the same time Circuit City said goodbye. While I do not know the circumstances, I photographed this location next to Columbiana Centre Mall. I like the design, personally, and they did a good job with the logo considering the peculiar name. The sign is intact as if nothing changed except for the store closing for a holiday. Edgy, weird and an oddly complimentary color contrast. It looked as good as new. What happened? 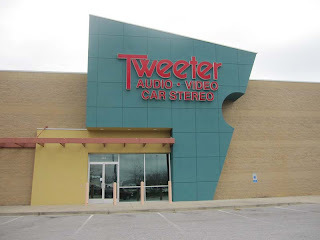 Tweeter sold more audiophile-level equipment than Circuit City and their staff actually knew what they were selling. It's a difficult segment because it's probably very profitable in good times, but is one of the first things people take off their shopping list in a recession. they also expanded very rapidly and probably had lots of debt that couldn't be covered by declining cashflow. We had one of these in Huntsville and they sold higher-end audio and video electronics than Best Buy and Circuit City, but their prices were higher. If they sold the same model as one of the other stores, it would be more expensive at Tweeter, and I think that's what did them in. I knew they were in trouble when they started closing at 7 PM instead of 9 PM on Saturday nights. The "Going Out Of Business" came soon afterward. It's sad that most people don't care about audio and video quality and are happy just to buy the cheapest thing and the "Home Theatre In A Box" mentality has ruined everything for people who want something much better. Try finding a really good pair of speakers or a really good A/V receiver these days without going to a city at least as large as Nashville or Atlanta. 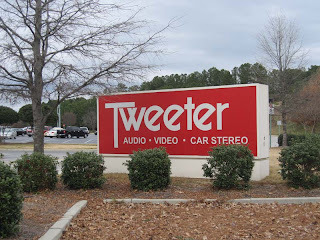 Tweeter's segment used to be dominated by local audio stores. They were more expensive than mass market chains, but cheaper than many homegrown operators. As manhufacturers become more willing to sell to mass merchanising chains and formerly grey-market mail order retailers like J&R, the pace for these stores has become smaller. Tweeter is in litigation because of merchandise paid for but delivered before the bankruptcy. I believe Tweeter bought out Hi-Fi Buys aka "Hi-Price Buys". Like Chris said, in many cases they carried the exact same merchandise as Best City and Circuit Buy, but for prices anywhere from 25% to almost 100% more. This place was re-purposed as a Jared's within the last year. It looks completely different now with a large new facade.